Upon arrival at your FFL Holder, inspect your firearm to make certain that everything is acceptable before filling out the necessary paperwork. Once the transfer of the firearm is complete, the manufacturer's warranty is then in effect and from that point on any complications with the firearm will need to be handled by the manufacturer. A 15% restocking fee will be incurred on any returned firearm and any order cancellations. All returns and/or exchanges must have prior approval and be in the original condition when they left Able’s. Any freight charges involved in the return are the sole responsibility of the customer. By signing below, I agree to these Terms & Conditions and I agree that all information provided is correct. 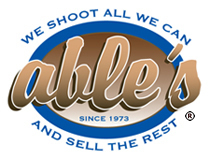 Able's must have a file copy of the dealer's FFL (unless already on-file with Able's) AND this FFL Transfer & Confirmation Form before we can ship your firearm(s).